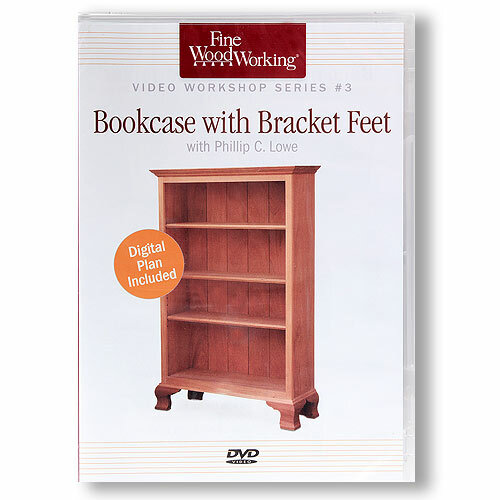 Learn along with award-winning woodworker and teacher Philip C. Lowe as he crafts this classic bookcase with adjustable shelves. You'll learn important woodworking techniques and build your skills while building this elegant project. And you'll gain experience and confidence as you watch a pro construct a sturdy case and face frames, cut curves with a bandsaw, edge plywood, shape moldings, glue up, and add masterful finishing touches. The basic case has a flat-bracket base, with simple curves cut on the bandsaw. Or, you can substitute an ogee bracket foot.